DO NOT plug the 2in1 X-Adapter™ into more than one console at a time. Doing so may damage the X-Adapter™. You must make sure you screw in BOTH serial cable screws on both the adapter and controller sides. Make sure to note the section on Digital/Analog, which will alleviate many issues you may encounter. Programming is for the PC/Mac™ only, it has no function on game consoles. The Trackball is not supported by the 2in1 X-Adapter™. You may, however, be able to use the trackball in the USB port of your console directly. List of Wii games with GameCube and/or Classic Controller support. NOTE: Your controls won't work on the Wii system menus, it will only begin to work when you launch a compatible game. On gaming consoles, the unit operates just like a standard gamepad, with buttons assigned to the arcade buttons. See the appendix for the appropriate button legend for your game system. You can play with four players using two X-Arcades™ and two 5in1 X-Adapters™. Toggle between analog thumbstick and D-PAD by pressing the Modifier on the side of the controller. While using Analog 1 mode (Select+Button 2) you can change how sensitive the movement is from normal full-tilt (default) to half-tilt sensitivity. Half-tilt sensitivity would be equal to moving the analog thumbstick on your gamepad to about halfway in any direction instead of fully (full-tilt). This is useful for games that you need more precise movement in, for example in a racing game, or to make your character move slower in your game. Some games may require the use of 2 control devices simultaneously, for example, console versions of arcade classics like Robotron™, SmashTV™, Crazy Climber™, and Karate Champ™. While the X-Arcade™ is not ideal for all types of games, for example' first-person shooters, it now has the ability to play all of them thanks to the new DualStick Mode. DualStick Mode makes the second player joystick of a dual X-Arcade™ act like the right analog thumbstick on a gamepad. But it also makes the buttons on the player 2 side mirror those of the player 1 side, so the buttons on both sides can be used for single-player gameplay. As you may have gathered, this means that DualStick mode is for single-person gameplay, and requires a 2-player X-Arcade™ controller, it will have no effect on an X-Arcade Solo™ for example. Dualstick mode also does not apply to Dreamcast™ gameplay as it only uses one analog thumbstick. 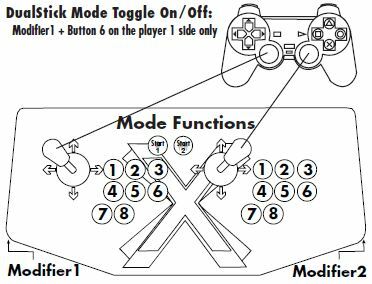 DualStick mode is toggled on and off by pressing the Modifier and button 6 simultaneously, and while in DualStick mode you can still change Joystick 1 between D-PAD and analog thumbstick as usual. The first thing you want to do is test the X-Arcade™ on your PC using the X-Arcade™ Test Utility Program to check that it is being recognized by your PC properly. If your controller works in the X-Arcade™ Test Program, then your controller is fine. Run the X-Arcade™ Test Program. Make sure all of your connections are tight and secure, including all of the screws on the console cable (needed for ground). There is a 200ma fuse inside the adapter, make sure it is attached firmly and not blown. I CAN'T MOVE AROUND IN THE GAME MENU! The game you are playing may require that you use the digital control to navigate the menu, you might be in analog mode (or vice-versa). Change the mode of your joystick as instructed. On the Nintendo Wii, your controls won't work on the Wii system menus, it will only begin to work when you launch a compatible game. HOW DO I CONNECT THE 5IN1 TO MY WII, THERE ARE NO CONTROLLER PORTS! WHY CAN'T I PLAY SOME GAMES ON MY WII? Most games on the Wii ™ require the use of the motion controller, and you certainly don't want to be throwing the X-Arcade™ around, something or someone WILL get damaged! But all Virtual Console games and GameCube™ games can be played with the X-Arcade™, as well as Wii™ games that have GameCube™ controller support. If the game lists support for NGC (Nintendo GameCube) controllers, then your X-Arcade™ will work with it. A full list of compatible Wii™ games can be found on the 'Support' section at www.x-arcade.com. Also remember that your controls won't work on the Wii system menus, it will only begin to work when you launch a compatible game. MY CONTROLLER IS NOT WORKING ON PSX GAMES? Some older PSX games that were released before the dual-analog gamepads need to use True Digital mode, simply press Select+Start to activate it. PLAYER 2 SIDE IS CONTROLLING PLAYER 1! You either have the cables reversed, or you are in DualStick Mode. MY CHARACTER IS MOVING SLOWLY! You are in Slow Tilt Sensitivity Mode. MY LITTLE BROTHER TRIPPED OVER THE CABLE AND YANKED IT OUT OF THE X-ADAPTER! Don't panic! Simply unplug the X-Adapter™ Cables from the Game Console and reconnect them to the 5in1 X-Adapter™ before plugging them back into the console. DO NOT plug in the X-Adapter™ cables while they are connected to the game console. DREAMCAST™ VMU: HOW DO I SAVE/LOAD GAMES? Most Dreamcast™ games can Save/Load from a gamepad plugged into another controller port. For the games that require it to be in the player 1 port, you could Load your game from a normal controller when you first turn on the console, and then hot-swap to the X-Arcade™ to play. At the end of play before turning off the console you can hot-swap again to the gamepad to Save your game. However, because of potential damage to the Dreamcast™ console from hot-swapping, it is not advisable to do so and customers may do so only at their own risk.